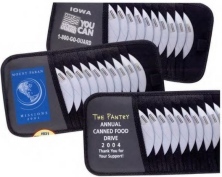 Inexpensive Personalized Car Visor CD Holders -Organizers. Promotional, Custom Printed in Bulk or Blank. 12 CD/DVD's. Budget Prices for USA, Canada. 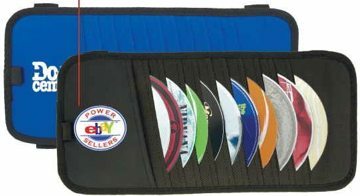 Bulk economy car visor CD organizers hold 12 CD's or DVD's in anti-static pockets. This sturdy CD holder features two elastic straps on the back for attaching to your car visor. Enjoy easy access to your favorite music. We also supply wholesale blank (not imprinted) Car Visor CD Organizers: see the Price List below. Free artwork design. Budget Prices in the USA and Canada for personalized Car Visor CD Organizers. American clients pay no taxes. PACKAGING: Bulk, 100 units per carton. Unit Prices below include your 1-color custom imprint, or they are for blank (not personalized) visor organizers. MATERIAL: Non-Woven Polypropylene and PVC. PRODUCTION TIME: 10-15 days after art approval; contact us for faster production.